A true conservationist is a man who knows that the world is not given by his father, but borrowed from his children. 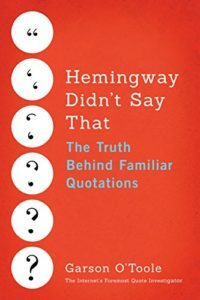 QI believes that the quotation marks signaled that Hall was not claiming authorship of the saying. He was simply using it as a label for his essay, but this usage was certainly confusing, and some later citations credited Hall with the saying. There is only one world and, as was pointed out by the Australian Minister of the Environment at the OECD Ministerial Conference on the Environment last November, we have not inherited the earth from our fathers and are hence entitled to use it according to our wishes. We have rather borrowed it from our children and have to maintain it properly until they can take over. ‘We have no right to destroy any other life form’, ‘We have the capability to destroy other forms of life, therefore, we have the responsibility to see that they are not destroyed’, or ‘We have not inherited the earth from our parents, we have borrowed it from our children’. “We have not inherited the Earth from our parents, we have borrowed it from our children.”— International Union for the Conservation of Nature, World Conservation Strategy. “We have not inherited the Earth from our fathers, we are borrowing it from our children” — so proclaims the cover of Lester Brown’s latest book. This Amish saying is quoted by a Glacier Bay National Park ranger in an open letter of tribute to John Muir in this 150th anniversary year of the pioneer naturalist’s birth. Remember, we don’t inherit the earth from our fathers, we borrow it from our children. And if you borrow something you don’t have the capability of paying back, you are actually stealing. When James Baker was Secretary of State, he quoted Emerson as having said, “We have not inherited the earth from our fathers, we are borrowing it from our children.” Emerson didn’t say that. Who did? A Celestial Seasonings tea box calls this an “Amish belief.” The saying is more often called a “Native American proverb.” Neither is likely. The maxim is a little too perfectly tailored to today’s headlines. Its origins remain a mystery. On the cover of the book Building a Sustainable Society, by Lester Brown, is the quote, “We do not inherit the earth from our fathers, we are borrowing it from our children.” Lester says he got that quote from me, though I don’t remember having said it. At home in California, I searched my unorganized files to find out when I could have said those words. I stumbled upon the answer in the pages of an interview that had taken place in a North Carolina bar so noisy, I could only marvel that I was heard at all. Possibly, I didn’t remember saying it because by then they had me on my third martini. Brower does not give the date of the North Carolina interview. In conclusion, QI would tentatively assign credit to Wendell Berry for crafting the first version of this statement which has been evolving for decades. Moses Henry Cass employed the word “inherited” instead of “given” which appeared in Berry’s phrasing. Now the most popular modern expressions use “inherited” or “inherit”. This article represents a snapshot of what QI has found and it may be updated in the future as more pertinent data is obtained. Image Notes: NASA depiction of Earth rising over the moon’s horizon. Wendell Berry photographed by Guy Mendes via Wikimedia Commons; image has been cropped; licensed under Creative Commons Attribution-Share Alike 3.0 Unported license. Update history: On January 26, 2014 the September 1980 citation was added. The top image was changed to include Helen Caldicott. On July 17, 2014, the top image was changed to show Wendell Berry and Earthrise. In addition, several citations were added: 1971 “The Unforeseen Wilderness”, May 1971 “Audubon”, July 1973 Senate Hearing, August 1973 “The Southeast Missourian”, May 1976 “Liberal Education”, and May 1978 “The Pittsburgh Press”. Also, the conclusion was rewritten.